#29. 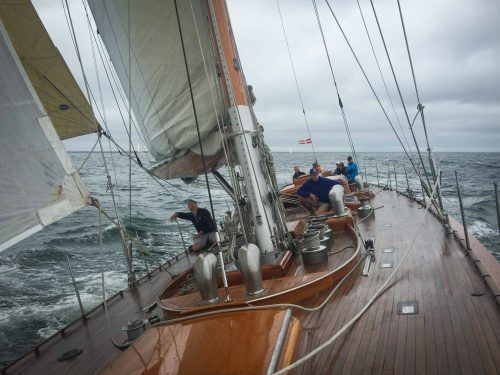 The Vinyard Cup, and a birthday afloat.. – Sampson Boat Co.
Whilst we were cruising around Nantucket with the boss on board, I had a free afternoon, and hitchhiked across the island to visit the Gannon & Benjamin boatyard in Vinyard Haven. This little workshop lies right on the beach, and was set up by Nat Benjamin and Ross Gannon in the early 80s. They have a marine railway for launching and hauling boats, and the whole operation is ridiculously picturesque and wholesome. 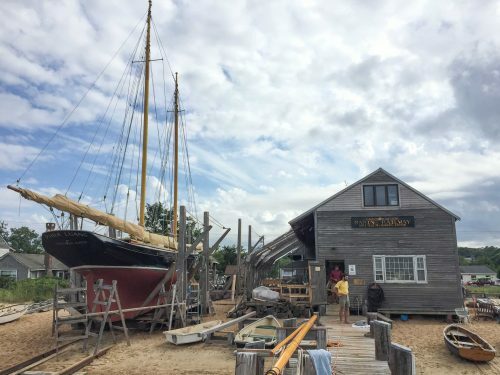 In the winter, of course, the environment is less hospitable, but their team of shipwrights continue to work year round in their open shed, often shoveling snow out of the way to get to their projects. 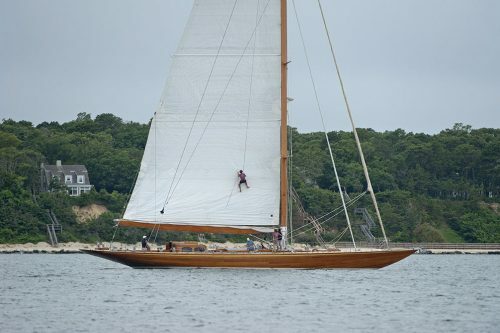 The beach in front of the yard is prime real-estate for drinking beer and ogling sailboats, and it was here that I met the Skipper of Sophie, a 90’ Bruce King replica of the J-class Endeavour. 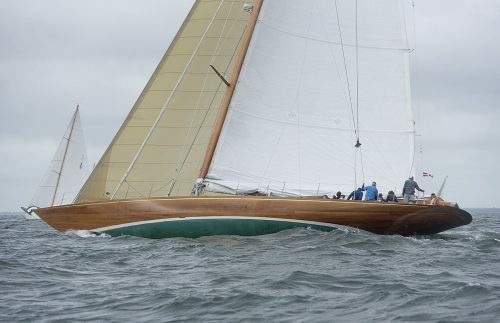 He invited me back to race in the Vinyard Cup, and so a week later I found myself inside a rather bumpy ferry, on my way back to the island from Newport. 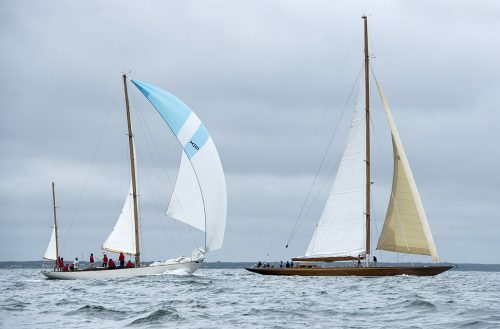 The small regatta is a lot of fun, and there were some great boats and crews involved. The wind was ideal (although a little strong for Sophie – we were the only boat that needed to fly a reefed main), and although the skies were mostly overcast, the sun did pop out to say hi every now and then. I didn’t pay a huge amount of attention to the results (I generally don’t, unless my boat is winning), but I know Ticonderoga did well, as did Santana and Saphaedra. 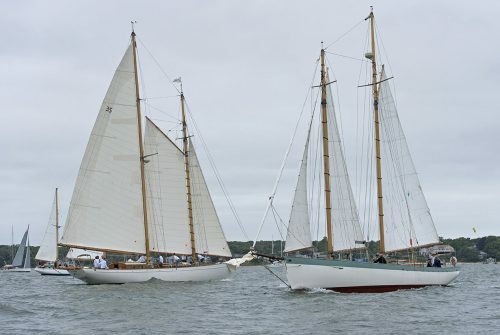 The Blue Peter (British flagged 1930s Milne cutter) and Juno (built by G&B in Marthas Vinyard) have an interesting rivalry, based on some handicap dispute, as usual. On the first day The Blue Peter apparently performed some dastardly maneuvers on the start line that left Juno at the back of the fleet, and so to get their own back, some of the Juno crew rowed out to their competitor’s 65’ sloop, whilst everybody was at the (dangerously free) bar. The next morning, Matt (owner and captain of The Blue Peter) found that his small American courtesy flag had been replaced with an enormous stars and stripes. 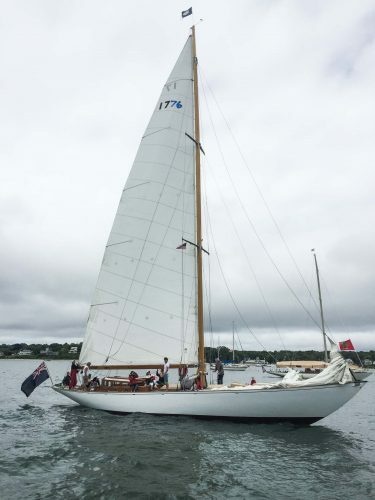 If he thought he had got away lightly, he was mistaken – we were sailing beside them as they hoisted the main on the way out to the course, and we noticed that their sail number, 17, had been defaced with blue painters-tape to read the year of the American revolution – 1776! As they reached full hoist, Juno swanned by, with full crew chanting the National Anthem, and saluting The Blue Peter’s mainsail. Matt looked up and swore, but took it well, and proceeded to beat Juno on handicap. There are a couple of big old Schooners in the harbour there, the Alabama and the Shenandoah, owned by the Black Dog Tall Ships Co. They also own a wonderful shed full of old wooden boats of all shapes and sizes, and a few of us wandered around this unintentional museum, in awe of the history and the beauty inside. There is even a one hundred year old Bristol Channel Pilot Cutter in there, in remarkably good condition. 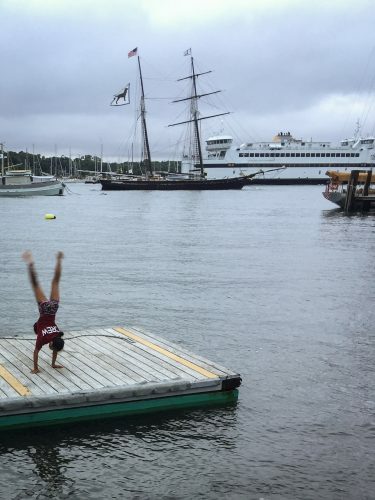 Back on the mainland, the Newport Folk Festival took place the next weekend, and it happened to be my birthday too. 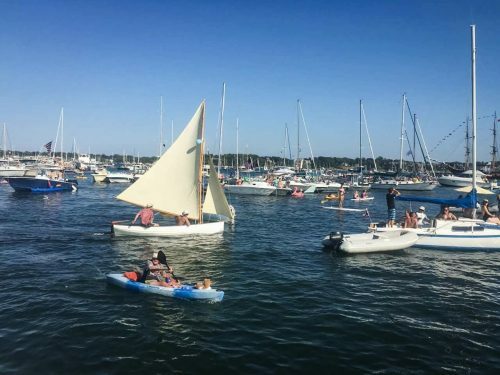 The crew and I took two of our tenders over to the water just in front of the main stage, and joined the hundreds of other anchored boats crammed into the tiny bay. 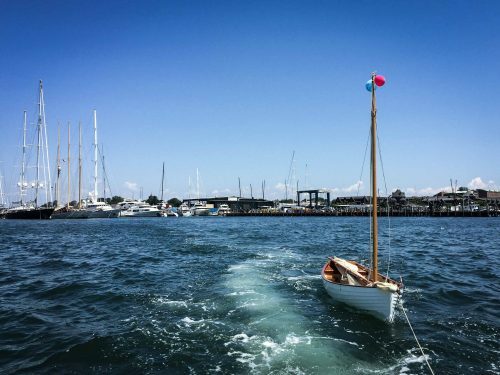 We sailed Koko, our Gunter-rigged dinghy, in between motorboats and sail-yachts, kayaks and rubber rings, swimmers and rowing boats, while Patti Smith and Ryan Adams played in the background. 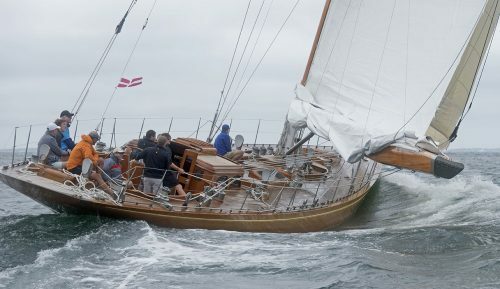 Some people cheered as we missed their yachts by inches, and others scowled, but Koko steered true, and apart from bouncing our dagger-board harmlessly off an anchor-warp, we got away with it. Later on, all the big yacht crews rafted their tenders up together, and formed an inflatable floating city of debauchery and indecency. The tomfoolery lasted for several hours, but eventually we sailed on back to Adix, slightly the worse for wear. It had been a good day for a birthday. Your sense of humor is priceless. I think that is a mainstay of what keeps you going.